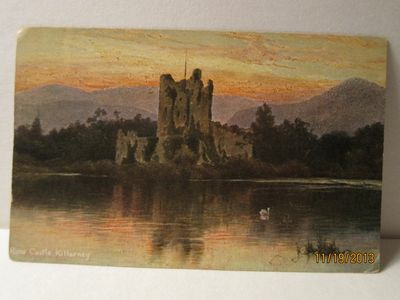 On the Front of the Card: "Ross Castle Killarney"
On the Back of the Card (Left Side): "Copyright; S. Hildesheimer & Co., Ltd. London & Manchester. Killarney. Series No. 5422." Publisher: S. Hildesheimer & Co., Ltd. Stamp Box: Dotted Square framing "Printed at our works in Bavaria." For more cards of this type, please see the full list of "Castle" Postcards in the "Architectural" Section.